Artist Reception and Talk: Wednesday, February 6, 6-8 p.m.
Stuart Klipper, an internationally known photographer based in Minneapolis, has traveled the globe capturing pictures that crystallize the defining characteristics of a place. He fell in love with the Sápmi region of northern Sweden – the indigenous homeland of the Sami people – and returned there after the 1986 Chernobyl disaster to document with haunting photographs how the landscape was impacted. Klipper aimed to make the invisible, visible: indicating the radiation level of the area in the photograph on each print. More exhibition and artist info. Join us to celebrate Stuart Klipper and hear about his work at the Artist Reception and Gallery Talk on Wed., February 6 (included in museum admission). Light refreshments will be available. FIKA is also open until 8 p.m. serving the full menu, cocktails, wine and beer. Thursday, Feb. 14, 7-8:30 p.m. The performers of The Theater of Public Policy will lead a special guided tour of ASI’s Imagine exhibition. Laugh, learn and sip on a complementary beverage. $30 ASI members / $35 non-members. Register here. Other improv tours on March 21 and April 18. Thursday, Feb, 14, 5-8 p.m. 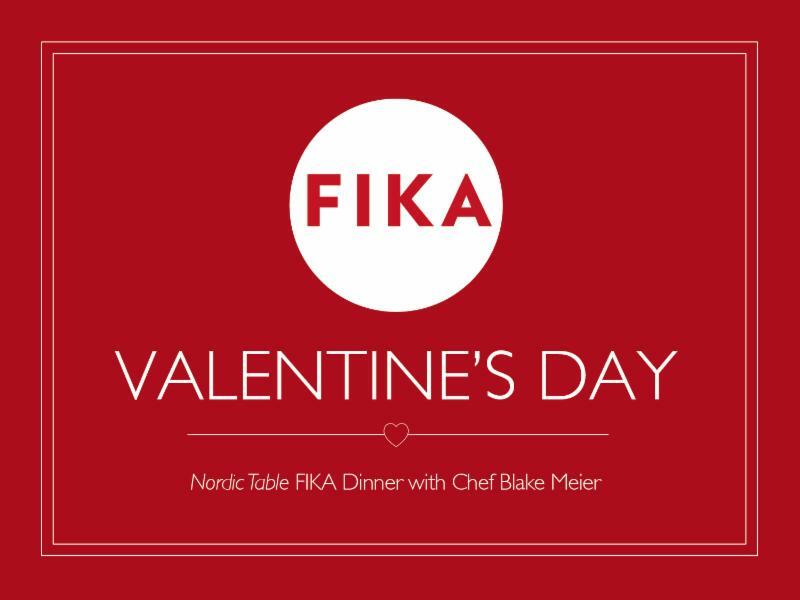 In this special Valentine’s Day dining experience with FIKA’s executive chef Blake Meier, enjoy a fabulous prix fixe, three-course meal where you can select from Nordic-inspired dishes including scallops and citrus, tenderloin medallions or braised mushroom ravioli for the main course, with optional bubbly and wine pairings. Click here for the full menu and other details, including available reservation times. Last seating is at 7:30 p.m.
Only $59 per person, including tax and gratuity! Wednesday, Feb. 6, 6:30-8:30 p.m.
to cards or other crafts. $45 ASI members / $55 non-members. Register here. Saturday, Feb. 9, 1-2 p.m. Kids grades K-3 can create colorful cards for Alla Hjärtans Dag in this fun craft class. $10 ASI members / $15 non-members. Register here. Wednesday, Feb. 13, 6:30-8:30 p.m. This card workshop is for the grown-ups! Spend an evening making a set of fun or funky Valentine’s Day cards while enjoying a signature drink from FIKA. $35 ASI members / $45 non-members. Includes one beverage. Register here. 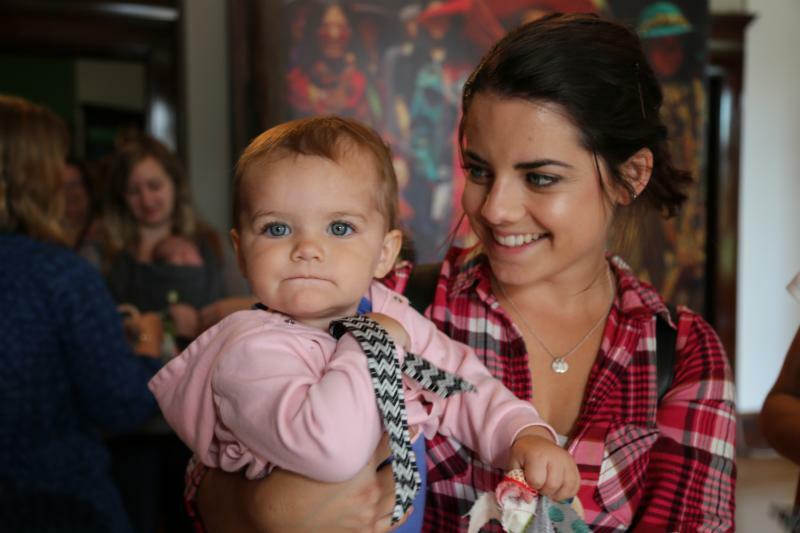 Friday, Feb. 15 & Saturday, Feb. 16, 9-10 a.m.
Make a morning playdate at the castle for activities including Valentine’s crafts, story time, and music and movement. $8 per family; no registration required. By digitally knitting together his own photographs, Erik Johansson creates the kinds of impossible worlds we can only find in our dreams. The exhibition at ASI contains nearly 30 of Johansson’s works, including seven new pieces shown here for the first time. In this interactive exhibition in the ASI Family Gallery, kids (and their adults, too!) can play and pretend to sell wares in a European-style market. More info. The Egg is landing in ASI’s courtyard! 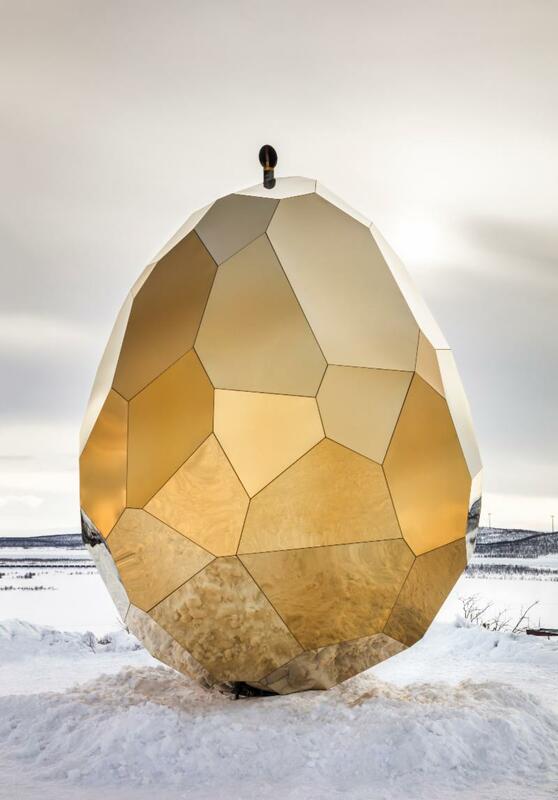 This must-see, five-meter-tall golden, mirrored egg is a sculpture and a functional sauna. Solar Egg by Bigert & Bergström for Riksbyggen is intended to hatch warm conversations. Visitors will be soon be able to book a sauna in March and April. Click here to learn more. ASI hosts the exciting Midwest premiere of a collection of early Viking boat grave artifacts, travelling outside of Scandinavia for the first time this year! Recent research sheds new light on aspects of Viking society, including the role of women, warfare, maritime innovation and Norse gods. 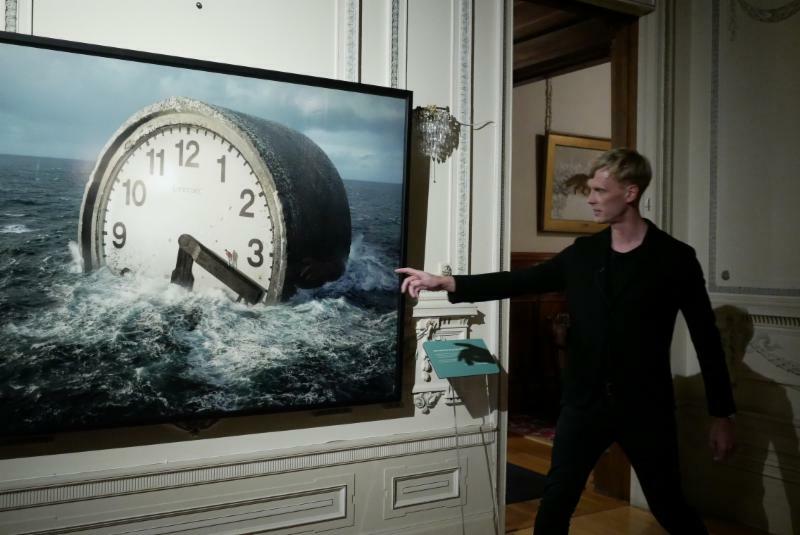 The exhibition is organized by Sweden’s Uppsala University and its Gustavianum museum and presented by Viking®️. 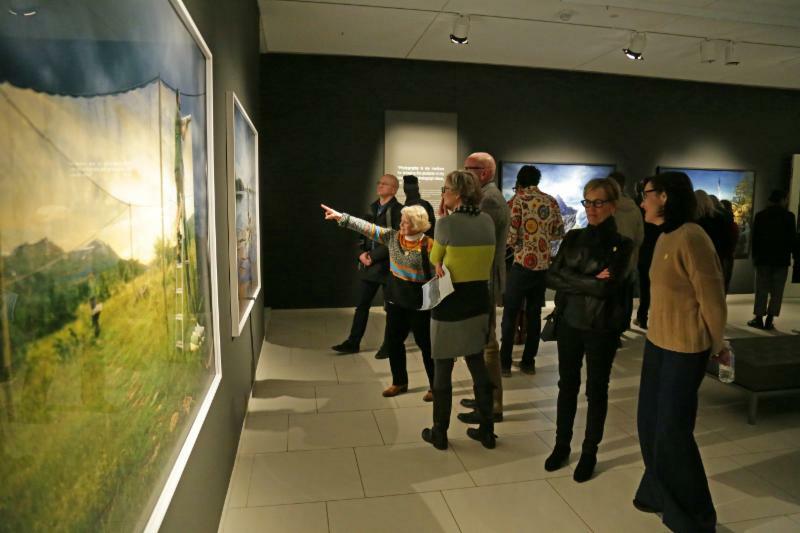 Get ahead of the crowd and book your private group exhibition tour today! Wednesday, Feb. 20, 6-8 p.m.
Winter in Sweden is even longer and darker than it is in Minnesota! But Swedes survive by making it mysigt, or cozy. Find out how to make your own winter more mysigt in this family-friendly evening with crafts, story time, fika and more! $5 ASI members / $10 non-members / free for kids. Register here. Swedish folk arts enthusiast Renee Vaughan will lead a conversation about dalmålning, also known as “kurbits” painting. Explore the design elements and motifs that characterize the art form. Included with museum admission; no registration required. Sunday, Feb. 17, 2-4 p.m.
Young makers in grades 4-12 can weave away an afternoon and make a tapestry on prepared looms! $25 ASI members / $30 non-members. Register here. 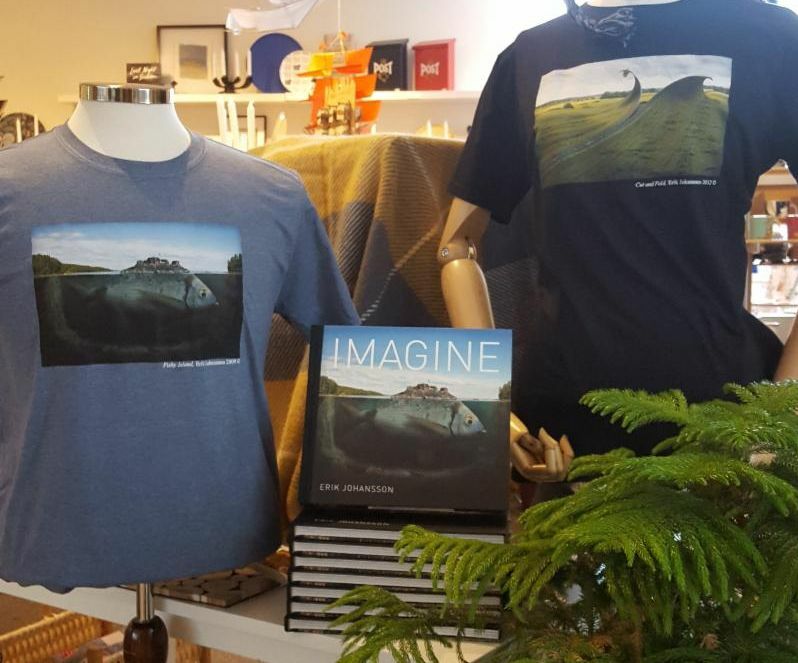 Friday, Feb. 22, 9:15-10 a.m.
Immerse yourself and your young one in ASI’s new exhibition, Imagine: Surreal Photography by Erik Johansson. This carrier tour is about 30 minutes plus 15 minutes of sensory play. Designed for babies up to 15 months. $15 for caregiver and child. Register here. Friday, March 1, 10-11:30 a.m. In ASI’s new preschool program, explore Swedish (and Swedish-American) traditions with your little one (ages 3-5). Topics will be explored through creative storytelling, music, art and more. Adult accompaniment is required (limit 2 adults per child). $15 ASI member / $20 non-members / free for adults. Register here. 5 Tuesdays beginning Feb. 5, 2-3:30 p.m.
Read works by female Swedish authors to explore how writing acts as a vehicle for social change. Discussions will be held in English. $60 ASI members / $70 non-members. Register here. The Sweden of today is at once both different and the same as in the past. 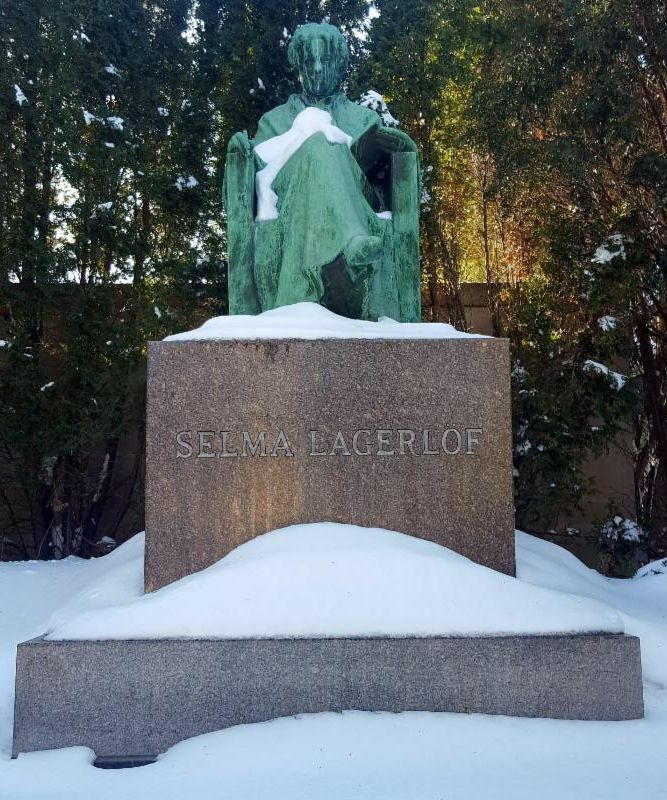 By using a mix of lecture, videos, discussion and activities, this class looks at different aspects of modern Swedish culture, such as holidays/traditions, government/politics, the importance of nature and more. $50 ASI members / $60 non-members. Register here. Sunday, Feb. 10, 2-5 p.m.
Professional storyteller Rose Arrowsmith DeCoux helps participants bring Scandinavian folk tales to life in this interactive workshop. 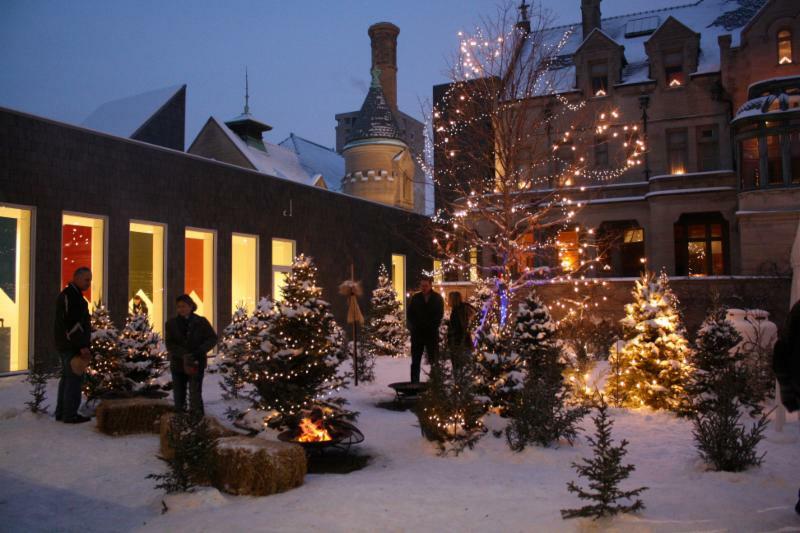 It’s your chance to let loose your inner tomte or troll! $30 ASI members / $40 non-members. Register here. Sunday, Feb. 24, 1-3 p.m. Embrace your inner Swede/Minnesotan and take a walk in the woods while learning some Swedish. We’ll go over basic vocabulary, sing songs and play a game. Suitable for beginners and kiddos! Class will meet offsite at Minnehaha Park. $15 ASI members / $18 non-members / $25 ASI member family / $28 non-member family. Register here. Beginning Friday, Feb. 22, at 5 p.m.
Get tips about how to make the perfect shaving horse – a useful tool for any woodcarver’s workshop – over three days. The shaving horses created will be used in ASI’s woodworking program. $160 ASI members / $185 non-members. Register here. Beginning Thursday, Feb. 21, at 7 p.m. 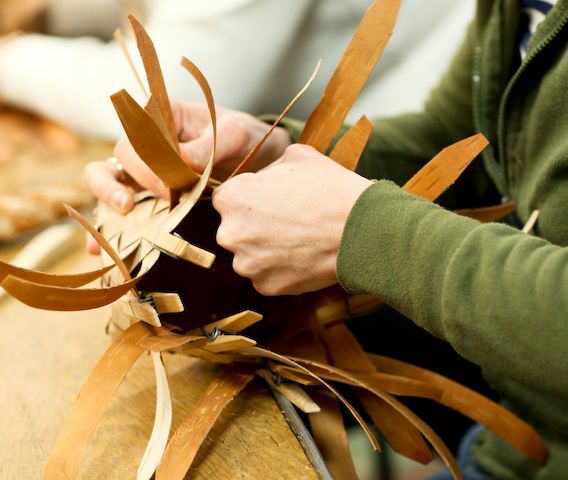 In this 10-week intensive course with master instructors Beth Homa-Kraus and Fred Livesay, students will learn to work with Minnesota birch bark and complete various projects, such as a small box and four-pointed basket. $240 ASI members / $270 non-members, plus materials fees. Register here. Learn how to use tenntråd (pewter wire) to create intricately braided bracelets inspired by Sámi designs with instructor Liz Bucheit in Intro to Sámi Inspired Bracelets (Feb. 9) and Advanced Sámi Inspired Bracelets (Feb. 10). In the week-long Weaving on the Warp Weighted Loom class with instructor Melba Granlund (beginning Feb. 11), participants will weave a Sámi-style grene, or blanket. Instructor Laura Ricketts is teaching various Sámi-style knitting classes in early March – check them out here. Don’t forget about the February 18 early bird registration deadline for Bill Jaeger’s Scandinavian Wooden Figure Carving workshops! 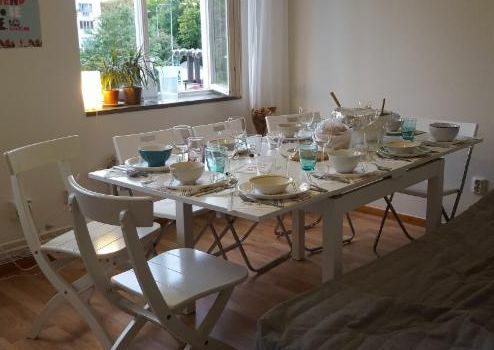 The dinner party is a staple of Swedish culture. Patrice Johnson will provide recipes for modern classics from appetizers to desserts (yes, including banana curry pizza!) for your own dinner party. Class includes one drink from FIKA. $55 ASI members / $65 non-members. Register here. Friday, Feb. 22, 6-8:30 p.m. & Saturday, Feb. 23, 1-3:30 p.m.
Make it at home! Icelandic skyr can be eaten by itself or used in other recipes. Make this thick and creamy yogurt in our two-day class. Young foodies (ages 10+) welcome to register with an accompanying adult. $55 ASI members / $65 non-members, plus $10 materials fee. Register here. Wednesday, March 6, 6:30-8:30 p.m. Build a cheese board from scratch with Caves of Faribault Head Cheesemaker Rueben Nilsson and Patrice Johnson. Learn how to make juusto (a baked Finnish cheese) and quark (a soft farmer’s cheese) and good things to accompany them. View Erik Johansson‘s work in ASI’s Imagine exhibition and then bring it home in his book of photographs. Set it on your coffee table and dive into 50 of his impossible worlds. Post cards also available.